Jordan Brand's first "N7" releases hit stores tomorrow. 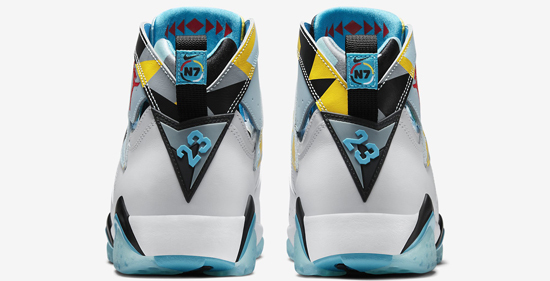 A part of the latest Nike N7 Collection, this marks the first time Jordan Brand has been added to the releases. 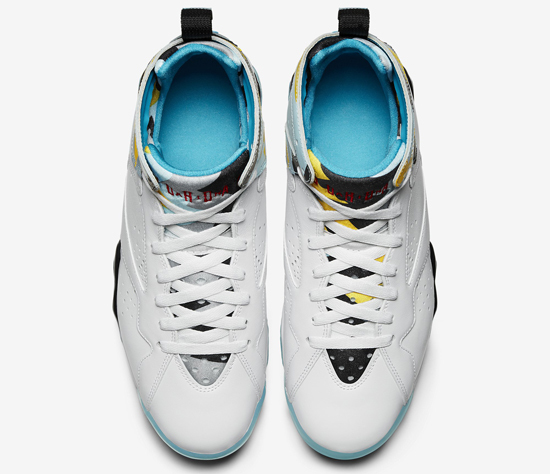 This Air Jordan 7 Retro comes in a white, dark turquoise, black and ice cube blue colorway. Featuring a white based leather upper with a unique multi-color graphite on the tongue, liner and top triangle piece. Black and turquoise accents, a full icy blue translucent outsole and "N7" branding on the back heel loops finish this pair off. A limited release, look out for them at select Nike retail locations, Eastbay and select Foot Locker/House of Hoops locations on Wednesday, June 3rd, 2015. Retail is set at, $190. Enjoy the official images below of the Air Jordan 7 Retro N7 in white, dark turquoise, black and ice cube blue. If you're interested in picking these up when they release, check in with your local spots to see if they will be receiving them. Those of you looking for a pair now can, grab them from eBay here.